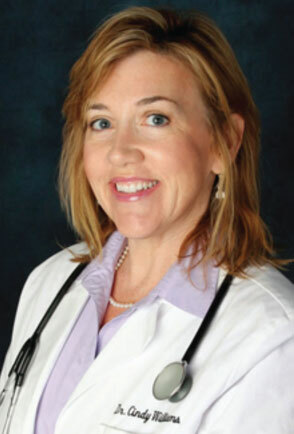 Dr. Cynthia Williams is board-certified in internal medicine and endocrinology and sees patients with thyroid and weight issues, metabolic syndrome, diabetes and other hormone-related issues. Dr. Williams is the director of diabetes care at Torrance Memorial Hospital and is a popular speaker on diverse topics including weight management and hormone balancing. Dr. Cynthia L. Williams was born in Lancaster, Pennsylvania. She attended Emory University and received her B.S. degree in Human Nutrition from Ohio State University in 1987. While pursuing her undergraduate studies, Dr. Williams was a member of Omicron Nu and Phi Kappa Phi. She graduated from Ohio State University Medical School in 1991 and interned at St. Mary Medical Center/UCLA College of Medicine in Long Beach. She received the Outstanding Ambulatory Care Resident Award from St. Mary Medical Center in 1993. In 1994, Dr. Williams received a Clinical Endocrinology Fellowship at Harbor/UCLA Medical Center. Between 1997 and 2000, Dr. Williams was on Active Staff at Huntington Memorial Hospital in Pasadena. During this time, Dr. Williams served as Director of the Metabolic Bone Clinic and the Insulin Pump Programs at the City of Hope National Medical Center. Dr. Williams has authored or co-authored several publications in the Endocrinology field. She is also active in sponsored research in the fields of diabetes prevention, and insulin studies. to meet your special needs. It’s important to take the time to get to know a patient and to address complex medical issues. It takes time to keep up to date with the constantly expanding knowledge base and abreast of the latest innovations. Today’s primary care physician sees an average of 20 to 40 patients each day, and oversees as many as 4,000 patients in all. The level of medical care inherently suffers in a healthcare system where quantity supersedes quality, and doctors are allocated an average of seven to fifteen minutes per exam. The physician’s day is chaotic. Basically, the doctor’s care and attention is diluted by huge patient responsibility. We are seeing the thoroughness of care fall below the expectations of many patients, as volumes continue to increase. In an effort to battle rising health care costs, physicians are compelled to comply with standards set by a managed care system which may not translate into what is best for your health. The quality of medical care suffers in a system where the definition of success is “being busy.” Healthcare reform and managed care threaten to infringe even more upon your access to truly personal care. It makes all the difference if there is a medical quarterback, a broadly trained and experienced physician to coordinate care, anticipate problems and so better prevent them, and respond to the first sign of an illness before it becomes full blown. Why do I offer concierge level care? Practicing medicine is my passion. I have devoted myself to developing meaningful relationships with my patients. By listening to you and getting to know you personally, I can provide a highly individualized care plan to meet your special needs. Unfortunately, over the last several years the constraints imposed by commercial insurance and Medicare have made these principles difficult and sometimes impossible to achieve. The current system rewards speed and technology…not listening and compassion. Despite my best intentions, I must see more patients than ever before, and I must spend too much time on tasks not related to your care. It has become difficult to see you on short notice, to respond to your phone calls promptly, and to devote the necessary time to each patient which I believe is so important …. a situation that is unacceptable to me. Maintaining the highest standards of medical care and keeping my patients feeling their best has always been my highest priority. I have made the decision to change my medical practice in a way that will allow me to devote more time to your individual healthcare needs. “I have been a patient of Dr. Cynthia Williams for over 15 years. During this period I have experienced the normal encounters that come with age. I have also had a couple of unique problems and Dr. Williams and her very capable and excellent staff have always been available to answer all of my questions and address my concerns with level thoughts. I too have a congenital problem and Dr. Williams expertise as an endocrinologist have further added to my relief. If you really want to take control of your life and are 100% committed to following very good medical treatment, this is where you need to be seen. What are Dr. Williams’ credentials? I provide the highest quality medical care, emphasizing a proactive, comprehensive approach to disease prevention and health management while nurturing and strengthening our physician-patient relationship. I want you to be completely satisfied with every aspect of your care. So I still need health insurance if I enroll with you? Yes. My new medical practice will not take the place of your general health insurance coverage. My practice is a primary care and endocrine medical practice, not a health insurance program. You are advised to continue your HAS, PPO, Medicare or other insurance program. Yes. I will bill your insurance company directly for office visits and other medical services. If your insurance carrier plan requires a co-pay, I will collect it at the time of service. Office visit charges, with the exception of your Annual Wellness Exam, are not included in your annual fee.